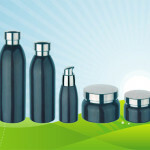 Glass cosmetic containers have many different uses, which is why they vary in sizes and styles. For information about different options, continue reading below. Liquid foundations are commonly kept in glass containers because they house the liquid well and helps prevent air from drying it out. The sizes that the clear or frosted bottles come in include: 1, 2, 4, 8, 16 and 32 ounces. These have a variety of toppers that can be used with them, including pumps or orifice reducers. The caps that top these can be made of either aluminum or plastic and will screw on over the inside topper. There are also glass roll on containers that come in clear or frosted colors. These generally hold .35 ounces of liquid and can be used with rolling toppers to make application easy. Clear glass thick wall jars are also used for liquid foundations because the caps twist off and make it easy for users to take out the foundation. These generally are purchased in .5oz or 1oz sizes, but there are larger and smaller available. These are thick glass but have plastic containers that twist on and off. 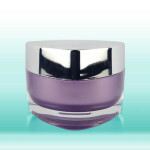 Clear glass cosmetic jars in sizes .25 and 2.3 ounces are commonly used for eye shadows. These house pressed and loose shadows and have twist off lids to make opening easy. These have thick walls to protect the shadow inside and there are different colors of lids available. 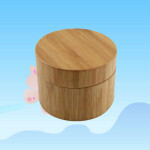 There are also some square glass jars that have circular molding inside of them to hold the actual product. These have a more luxurious look to them and still hold around 1 ounce or more on average. 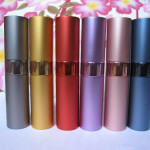 Glass roll-on containers are commonly used for lip glosses because they come in different colors and make application easy. The roll on ball also saves money because they eliminate the need for a separate applicator. These come in clear and frosted glass but also many other color tints. They can hold .35 ounces and have lids that screw over the roll-on topper. Clear glass jars can also be used for lip glosses, but only those that are solid. The size commonly purchased is .25 ounce, which has a wall thickness of 2.3 ounces. These have lids that twist on so users can easily access the lip gloss inside. Perfume is suitable for glass containers because the oils that are inside it won’t be able to seep out, like they would with plastics. 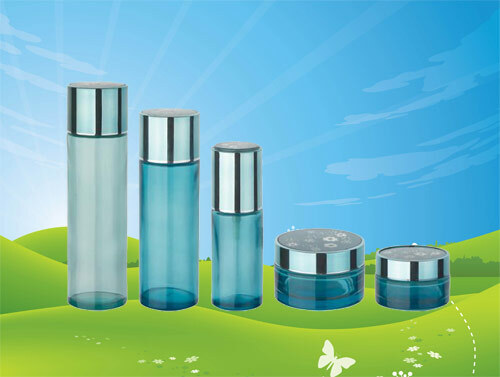 The common types of containers used are: perfume vials, roll on bottles, cylinders with sprayers, glass bottles and vials with droppers. These all have cylinder shapes and will generally hold .5oz to 1oz in each of them. The only exception to this is the regular glass containers, which can hold 5oz or more and normally have spray nozzles on the tops. The toppers that are chosen will depend on the method of application the buyer wants (i.e., dropper, sprayer, roll-on). Most of the smaller sizes are popular because they fit in purses and are easy to travel with. There are other glass shapes available for larger perfumes, and these vary. They can hold up to 3.5 ounces and generally have double walls to add more protection. 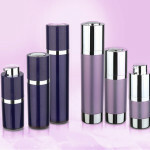 When choosing cosmetic containers, you will be faced with a choice of what materials you want to use for your products. Depending on what your product is, you may have the option of choosing glass, plastic, or metal. 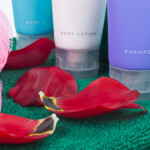 Below, find out what some of the benefits and drawbacks are for choosing to use glass as your cosmetic container material. If you do any research about cosmetic containers and their materials, you’re sure to find some information about the dangers of chemicals in plastic. A chemical compound, Bisphenol A (BPA) has been making headlines within the past few years. The compound was found in the lining of many plastic products. Research was done to determine if BPA was harmful and it was found to be a factor in a variety of health issues. While steps were immediately taken to eliminate BPA in food, health, and beauty containers, it’s still on the minds of many consumers. Choosing glass cosmetic jars eliminates the risk of having BPA leech into the product. 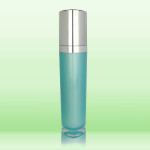 Glass containers are safe from harmful chemicals and provide a safe vessel for your cosmetic products. Going green is a huge trend in the beauty world currently. Brands are noticing consumer trends and a desire to be more environmentally friendly. One way to take a step toward being a more environmentally aware company is to make the switch to glass cosmetic containers. The environmental benefit to choosing glass is that the containers, after being used, can be reused or recycled. Chances are, plastic containers will be throw out after the product is used up. Many plastic cosmetic containers cannot be recycled. However, many consumers choose to save glass containers and repurpose them. Those who wish to dispose of their empty containers will have the option of recycling. In addition to health and environmental concerns, most consumers are also interested in getting the most for their money. One major drawback of plastic containers is that many of them don’t allow users to get every last bit of product from the container. It can be very frustrating to know that there is still product remaining in a container, without the ability to get it out. Glass containers are generally much easier to work with. Glass cosmetic jars usually feature a wider open mouth, allowing the user to remove the product either with a finger or with a cosmetic tool. While there are many benefits to chewing glass cosmetic jars, there are also some drawbacks. 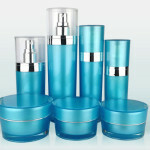 Glass tends to be slightly more expensive than plastic when it comes to manufacturing cosmetic containers. This means that additional money will need to be spent to create the product and the cost of the finished product will need to increase as a result. However, many consumers are willing to pay the slightly higher price for a quality product. The other concern with glass is that the container may be dropped and broken. Not only is this dangerous, but it will also cause the consumer to lose some of the product. These are factors to consider when choosing a material for your cosmetic containers.